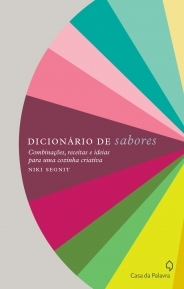 The Brazilian version of The Flavour Thesaurus – Dicionário de Sabores – is now available, published by Casa da Palavra, and complete with brand-new entries covering specifically Brazilian combinations like carrots with chocolate, and guava with cheese. Carrots with chocolate?! Intriguing! Would that be in a cake of some kind? Yes, It’s a cake . The carrot is used in the cake and it’s covered with chocolate. And cheese and guava are called here ” Romeo and Juliet”. The cheese resembles Feta cheese and it’s eaten with a guava preserve. I’ve used guava jam as a cheeseboard accompaniment for years. Came from an experience in the Caribbean. Just delicious with a really strong cheddar, but as you can imagine, equally good with Somerset brie, for example. Thank you for getting in touch. I tried guava jam when I was writing a few extra entries for the Brazilian edition. They serve it with cheese and call it Romeo and Juliet. I didn’t try it with brie though – it sounds good.